SkinPen® is the safest, most effective vertical Micro-Needling device that offers state-of-the-art skin rejuvenating technology. By creating a series of hundreds of vertical microscopic channels into the dermis, SkinPen® stimulates the natural production of new collagen and elastin. Traditional Micro-Needling derma rollers can bend, break, or even rust. As a result, infection or scarring may occur with reuse. SkinPen® is different. Through an optimized micro-channel creation, SkinPen® uses straight needles to penetrate at a 90-degree angle to stimulate your skin’s natural ability to produce new collagen and elastin formation, encouraging your skin to look and feel healthier. SkinPen® is extremely versatile and can be used on all parts of the body: face, neck, decolletage, arms, hand, legs, abdomen and back. This versatility makes SkinPen® especially helpful when addressing acne scars on the back and stretch marks on the body. 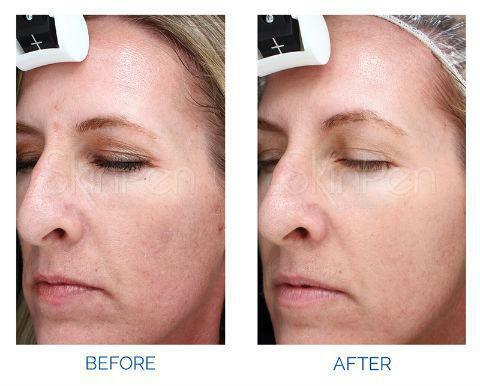 SkinPen™by Bellus Medical: An advanced microneedling treatment that stimulates your skin’s natural ability to produce new collagen and elastin, which can reverse years of sun damage, improve acne scars and stretch marks, and enhance the overall appearance of aging skin. Only through skincare professionals, SkinPen™ is a medical-grade, state-of-the-art precision tool that creates micro channels which allow medical-grade products to penetrate into the deeper layers of the skin, accelerating the repair process. Best of all, SkinPen™produces superior results with little or no downtime, and it can be used on all types of skin! It can also be used on any and all parts of the body, including the face, neck, décolleté (upper chest), arms, hands, legs, abdomen and back. This versatility makes SkinPen™a great option for addressing acne scarring on the back, or stretch marks on the body. To learn more about SkinPen™and schedule your complimentary skin analysis, call 972.985.5511.